Lots of Clarity in Lightroom makes the details pop. Graduated filter recovers washed out areas. Click for Before-After comparison. First off, an admission: I’ve never been much of a landscape photographer. It’s never very been high on my photography interest list, because I’m drawn more to people and action—two things that are generally absent from landscapes. 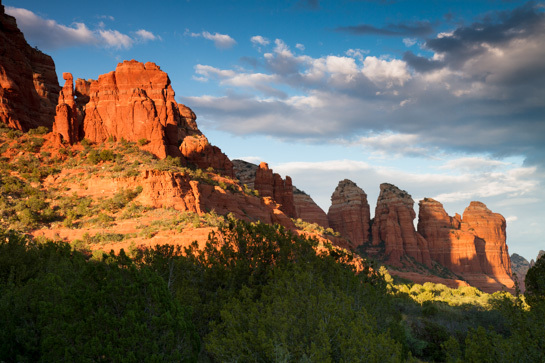 Nevertheless, when I find myself in beautiful surroundings—like the jaw-dropping red-rock country of Sedona, Arizona—I naturally want to pull out the camera and bring home some knock-out photos. 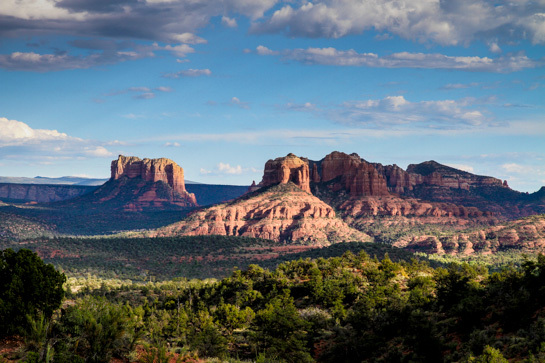 The shots you see on the page were captured during a recent four-day road trip to Sedona. After driving from San Diego through what is perhaps the most hellish, sun-blasted, desert moonscape in America— Interstate 8 along the Mexican border (107 degrees in the shade)—the ascent into Sedona’s sandstone canyons feels like arriving in heaven. These 300 million-year-old rock formations are so shockingly red that in warm sunset light they look almost artificially colored, like a bad Hollywood fake rock in a Star Trek set. Yet it’s just plain old iron oxide (yes, rust) slowly leaching away through the millennia, that gives the rocks that color. 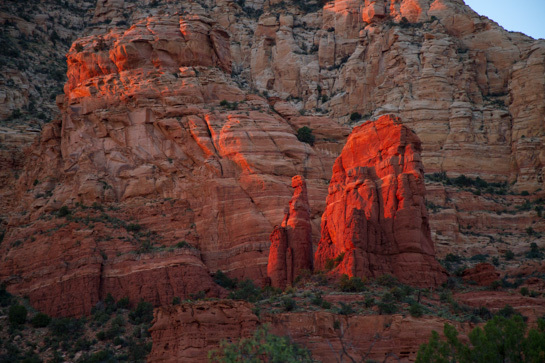 Red rocks + red sunset light = really, really red. Click for before/after. As always, of course, the photos on my camera never quite seem to capture the natural beauty that I saw with my eye. They look flat and washed out by comparison. That’s where Lightroom comes in. Whether shooting in RAW or JPG (on this trip I shot at different times in each mode), Lightroom gives me the ability to bring out the beauty in the digital images, to restore the sense of color and grandeur that I felt in these scenes in real life. The Lightroom tool that I turn to again and again in landscape photography is the Graduated Filter. Nothing is better, or faster, for recovering a bleached-out sky or a blown-out foreground than this one-click wonder tool. If you watched my Lightroom video course you saw how I use it for these tasks. The graduated filter helped reveal the faint rainbow above the rocks. Every photo on this page has had the graduated filter applied, sometimes to more than one area. Blacks — to recover the shadows lost in haze. Vibrance — although it’s it’s often unnecessary after Blacks. Saturation — usually decreased, to offset an unnatural increase cause by Blacks. Clarity — I like the punch that clarity can give an otherwise blah landscape (like the photo at the top of this page). Occasionally, I’ll even go into the HSL panel and adjust one of the individual color channels up or down. But that’s rare. I would like to wake up to this view every morning. If you’re curious, you can learn all about these techniques in my Lightroom videos. The thing I like best about doing these edits in Lightroom is the speed. In a matter of seconds I can adjust each photo, and I can even make several virtual copies to compare different adjustments side by side. In the past, I would have spent as much time editing one photo as I now do editing a dozen shots in Lightroom. I still may not be a great landscape photographer, but Lightroom at least gives me a fighting chance. Posted in: Photography, Post-Production, Software, Travel Photography. Great read and tutorial! 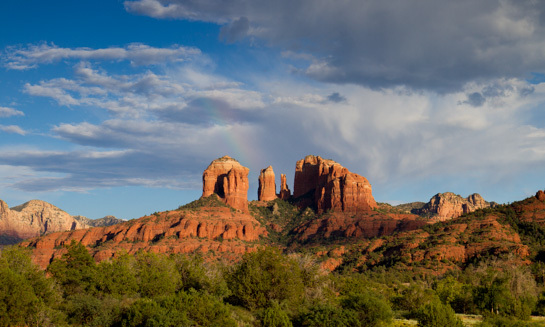 Being a Landscape Photographer I have visited Sedona numerous times – it is just Magical and you have done a fantastic job capturing it! I am now drawn towards People and Action and love your Off Camera Lighting Tutorials – they have accelerated my work beyond measure! When I saw the first photograph, I had to laugh! Last July my husband and I went to Sedona. I know exactly where you were when you took your photos. I have the same ones. Sedona is heaven on earth. I felt spiritually connected to the area and would love to live even though I’m not a fan of hot weather I would learn to deal with it just for the views. I thought Sedona was more beautiful than the southern and northern rim of the Grand CanyonI hope you had an opportunity to take the Pink Jeep Tour. I’m glad you got to experience a part of Arizona that is huge on the Wow Factor!! Phil, as I am a person photographer as well, you are making me try my hands at Landscape after seeing these shots put through Lightroom. But first, I have to view how you used the Gradient Filter in Lightroom. To be honest I have downloaded the course but still haven’t got around to it. One day! Phil, I can’t imagine any effort on your part resulting in anything but Wow! Read every Blog even though I shoot almost nothing but landscape – since age 13. A lifetime spent on golf courses of the world as a traveling amateur and an unskilled photo hobbyist, the venues of light, shadow, color and serenity have always made me feel alive. !2 years in Arizona provided some of the finest opportunities imaginable, not just Sedona but all the other attractions in the state plus the desert itself. Now at 88 I still love to shoot the dawns and sunsets here on the gulf coast and “play” with them in Lightroom and Photoshop. Thanks everyone for the very kind and encouraging comments. You all keep me inspired to do more! Phil, if i had ten thumbs all would be up. Landscape is one of the photography I love dearly, to see the artistic form that you discloses is very appealing. Lanscape photography is my thing. I love to take pictures of beautifull sceneries, specially in fall, using HDR techniques. I am living up north near montreal. Taking pictures of sceneries is fun, because its only you and the nature. Physhologically taking a picture of the magnificient nature beauty bring in me emotion and its like I was doing a prayer to mother earth. Like Ansel Adams, I love to see the beauty of the world and the mathematics of its shapes offered at our eyes.In a word its visual “poetry”. Would love to see the ‘before’ and ‘after’ shots using the ND Grad filter. I had to make a comment on this one. My husband was born in Sedona, we lived in Cornville Az for 25 years and hiked and rode horseback all over that country. It was like a trip home to see your photos. My husband is gone now, but it was our country when it was small, unnoticed and unknown. My husbands grandparents on both sides homesteaded there long long ago. The RIDGE resort was where his maternal grandparents homesteaded. I have lots of photos and snapshots of it there and YES.. it was special to live near there and spend many years there. I am in Montana now but the journey back was wonderful. Those photos you took was another horse ride with our dogs, or a hike. THANK YOU for sharing them. Sedona always inspires. Last year we enjoyed a 3 month whistlestop tour of as much of the U.S. as we could fit in. I’d never heard of Sedona before and regret not spending more time there. Great shots bringing back fond memories. (2) Lightroom made easy. However; I do not have the software on my computer. Will you kindly let me know, if it is necessay to have the software first before purchasing the above mentioned videos. Love your tutorials and courses. I am currently on a road trip in North and Southern California and I have to agree that LR4 is an excellent tool for bringing out what the eye sees but the sensor does not capture. I want to thank you for your simple and yet excellent tutorials. I am naturally a raving fan and look forward to purchasing more if your tutorials. I too hit the Sedona landscape a few months back and, as you were, amazed at the color and contrasts. Lightroom for me is such a fantastic tool to allow me to bring back the photo my eyes saw. Below is a link	to one of my photos, this is not a attempt at advertising, just wanted to share my art. I shoot with a Canon 7D and used a 17-55 S Lens. Funny, I have always done landscape photos, and because of your articles, I am now chasing the light photographing people. I find that I do not take a large number of distant shots, unfortunately due to the haze. I do, take a lot of close ups, I can stand in a 20’x20′ area, and by positioning my camera in sometimes precarious locations, I can take shots that redefine the area people have visited in such a way, they can’t identify the area. I like to take shots of landscape that allows the viewer to remark,”I don’t remember seeing that, maybe we need to go back”. This is the same way I am approaching shots of people. Thank You! Phil … I can’t imagine you doing anyhing that wasn’t top Flight. You Be Da Man! If I ever grow up, I wanna be like you!